When I discover a new technique, I can’t stop at just one. Same thing happened with my Mokume Gane obsession. In the first Tiny Canvas Tutorial Video I showed you how to create a simple 3-color sunset background. 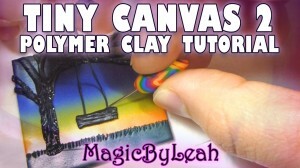 This tutorial is slightly more advanced using additional colors and glitter to create the effect of a sun that is nearly gone for the night.